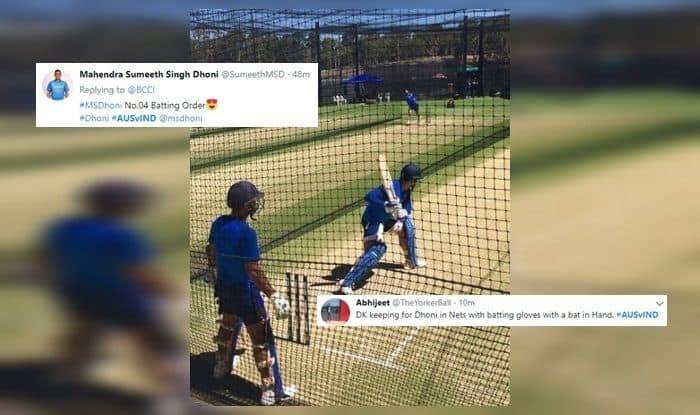 India vs Australia 2nd ODI: A picture of former India captain playing some spin in the nets at Adelaide with Dinesh Karthik surfaced on the internet on Monday ahead of the 2nd ODI and it seems to be creating all the buzz ahead of the 2nd ODI. India vs Australia 2nd ODI: A picture of former India captain playing some spin in the nets at Adelaide with Dinesh Karthik surfaced on the internet on Monday ahead of the 2nd ODI and it seems to be creating all the buzz ahead of the 2nd ODI. So, what is driving the netizens nuts over it? Fans are commenting on it and everybody has an opinion of their own. MS Dhoni scored a fifty off 96 balls. He came in at a situation when the team was looking down the barrel in a 289 chase. Dhoni took his time but stitched a crucial 136-run-stand with Rohit Sharma to get the chase back on track. Eventually, India lost but seems like Dhoni is best suited at No 4, that is what Rohit Sharma said at the presser and fans to seem to be thinking on those lines. Then MS Dhoni came in ahead of Dinesh Karthik. Some fans also feel Ambati Rayadu should play as the finisher and Dhoni, the anchor. The BCCI had earlier suspended and sent Rahul and Pandya back home from Australia after their alleged “sexist” comments in a television chat show. The second and third ODIs will be played on Tuesday and Friday at Adelaide and Melbourne, respectively.